MINNEAPOLIS (February 21, 2017) – Padilla was recognized as one of the 2017 B2B Top Shops from Chief Marketer, a listing of the top B2B marketing agencies throughout the United States. Chosen by the editors of the leading marketing publication, Padilla was awarded the honor because of the company’s depth of client work, creative acumen and analytical experience, among other factors. Through an integrated communications approach, Padilla provides a suite of marketing and communications solutions for its B2B clients in agribusiness, environmental sciences, financial services, health, manufacturing and technology. Its in-house research and insights team provides the foundation for the central strategy that comes to life through multiple channels. Emphasis is placed on meaningful and trackable engagement as well as bottom-line outcomes. 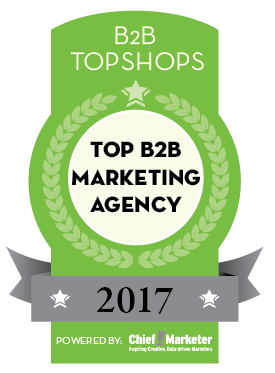 B2B Top Shops is an online searchable directory highlighting each agency’s core services and contact information, offering users a behind-the-scenes look at each shop’s culture and client work. B2B brands, vendors and marketers viewed this easy-to-use resource on ChiefMarketer.com almost 73,000 times this year alone. Chief Marketer, published by Access Intelligence, charts the customer journey from acquisition and engagement through conversion and retention. Via ChiefMarketer.com, print products, live events, awards programs and more, Chief Marketer offers data-driven intelligence, actionable insights, inspiring case studies and the latest technology trends to help marketers improve their campaigns and increase ROI.